Find reptile figurines and more at World Buyers. World Buyers has a great selection of wholesale reptile gifts perfect for novelty stores, museums and general gift stores. Select from cute ceramic turtles, iron lizard paperweights, frogs and more! Clearance price shown nearly 60% off! Clearance prices shown nearly 50% off. Beautiful sea life glass trays. Slightly concave. Sealife glass box with black lobster. Clearance Price shown is nearly 75% off! Nautical antique style lobster wall hook in vivid red! Screws not included. Clearance price shown now 60% off! Little metal seahorse tray. Soft seafoam green with antiqued edges. Antiqued silver metal turtle box. Removable shell! Antiqued silver metal turtle tray. Antiqued white metal sea turtle tray. Antiqued aqua metal whale knob. Great crab wall hook. Brown washed metal. 4pc minium. Must order in increments of 4. 2 set min. Must order in increments of 2. Ceramic blue whale planter. Each item is hand glazed and unique! Eunice the Whale ceramic plate. Blue and white with subtle brown speckles. Ceramic baby whale vase with blue/gray and ecru glazing. Accented with brown wash. Ceramic whale cubby dish. Antique style glazing. 4pc minimum Must order in increments of 4. Ceramic fish plate with marine blue crackle glaze. 6pc minimum Must order in increments of 6. Ceramic whale plate with a friendly smile. Turquoise with antiqued glazing. Slightly larger version of VDC92. Ceramic baby whale plate with a friendly smile. Turquoise with antiqued glazing. Smaller version of VDC91. Soft sage ceramic whale plate with brown antique-style glazing. Ceramic uni-whale ring tray. White with gold unicorn horn! How cute is he! Place him anywhere and at the ready. Nautical antique style lobster wall hook! Screws not included. Clearance price shown now 50% off! Chubby little brown metal seahorse tray. 4pc minimum. 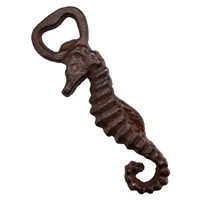 Must order in increments of 4,8,12 etc..
1dozen brown metal seahorse bottle openers. 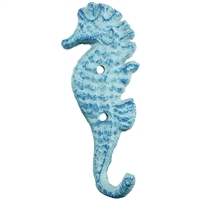 1dozen blue metal seahorse hooks. Blue ceramic whale cup. Can also be used as a ladle. Minimum of 4. Please order in increments of 4,8,12, etc..